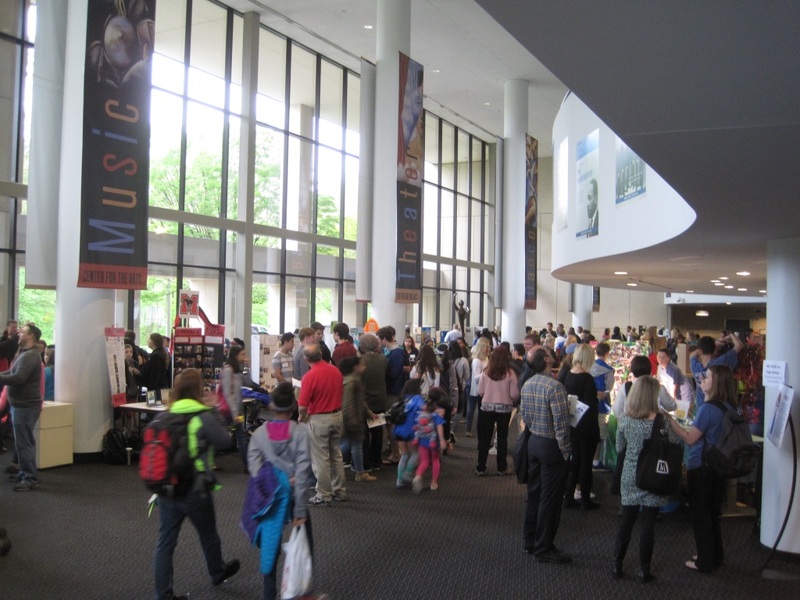 Approximately 500 school-age youth attended the sixth annual School Environmental Action Showcase (SEAS) at George Mason University’s Center for the Arts, along with several hundred teachers, chaperones, and event volunteers. Thirty-four schools from Alexandria, Arlington, Fairfax City and County, Falls Church, and Loudoun County were represented, each sharing the environmental work students have been doing in our region. Projects included schoolyard gardening, stormwater practices, recycling programs, invasive species control, and environmental research. At the opening ceremony, keynote speaker Ana Humphrey, now a student at T.C. Williams High School in Alexandria, shared her experience co-developing the Watershed Warriors Initiative from a class project in seventh grade. Ana and her classmates have developed curriculum and led elementary school lessons on wetland ecology and restoration in several Alexandria City Public Schools. This year, more than 90 students made musical instruments from recycled materials and performed together in the SEAS Music Festival. Teen-age participants learned how to tackle environmental problems using programming and sensors with Thinkabit Lab, a project of Qualcomm and Virginia Tech; students created, coded, and collaborated to build a “Robo Craft” with electronic equipment. SEAS partners also led hands-on activities at the open-air Eco-Partner area by Mason Pond. Activities included examining aquatic insects as indicators of environmental health, exploring the radiant heat transfer of different window types, and observing an active honey bee hive. Several awards were presented. Co-host Earth Force hosted the Virginia Caring for Our Watersheds finalist presentations, where ten student groups presented their projects to peers and competition judges in the concert hall. The Going Green Club at Rachel Carson Middle School won top honors for their Food Sharing project. They are planning to divert unopened/uneaten food from the cafeteria waste stream to donate to a local food shelter. The Fairfax County Federation of Teachers, a lead sponsor for the event, awarded Belvedere Elementary School the Dynamic Young Visionary Award for their work in waste reduction on their campus and the adjacent park, development of bird habitat, a seed sale program to promote vegetable gardening in the broader community and a bird feeder design and construction STEAM project. Congratulations to all who made SEAS 2017 such a great event!